The final report, which is a Portable Document Format (PDF) file, is stored securely online & downloadable from any client computer. After the Inspection is completed, the unedited Report is reviewed on site with the client. 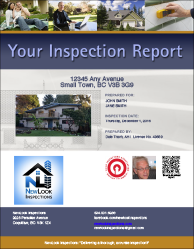 The Inspection Report is edited, proofread & delivered by email prior to the end of the day.